Lasagna made with zucchini? You betcha! You may be skeptical of the lack of cheese and noodles in this dish, but if you give it a try, you may very well be won over by the amazing flavor of this scrumptious (and healthy!) main dish. Of course, you can always add your favorite cheese or the dairy-free Daiya cheese that many grocery stores carry now. 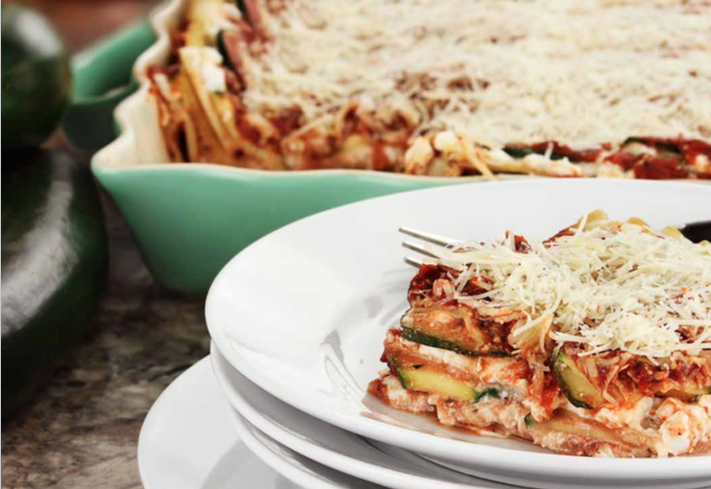 The health benefits of zucchini make it a great alternative to lasagna noodles. Zucchini is an excellent source of potassium, which aids in reducing blood pressure and heart rate. It’s rich in vitamins A and C and is a low-calorie vegetable. Zucchini also contains large amounts of flavonoid polyphenolic antioxidants that help rid the body of harmful free radicals and reactive oxygen species (ROS) that are involved in aging and various disease processes. The skin is also abundant in dietary fiber. Cover with foil and bake for 1-1/2 hours until soft. Let it set up at room temperature for at least 15 to 20 minutes before serving. *Prep Notes: We like our zucchini sliced as thinly as possible. A very thin slicer blade speeds up this process. Don’t worry if the strips tear. Broken strips work fine. You can also use a salad shooter and slice into thin round circles. If you’re not dairy free, adding some shredded cheese on top is always yummy.